You done with your Christmas cards yet? Me either! I need about a dozen more, but I will get there, I always do! Today’s card is a more simple version of one I posted a few weeks ago. You can find that post here. 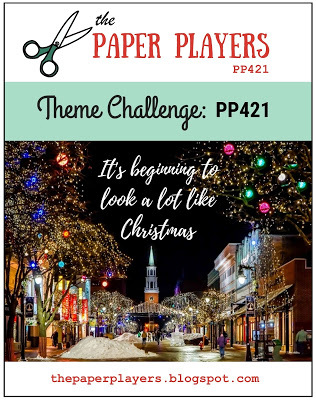 I am linking my card up at The Paper Players this time around where they have a theme of Christmas challenge starting and also over at Inkspirational where it’s Anything Goes Christmas. The sentiment is from Verve, the wreath and sparkly red paper is SU, the banner die is MFT, and the bow is Paper Smooches. I heat embossed the greeting and punched out the little holly berries with a hole punch. Categories: Cards | Tags: Card making, Cards, Christmas cards, rubber stamps, stamping, Stamping Up | Permalink. Your card is so gorgeous. I love the wreath and the red edge design. 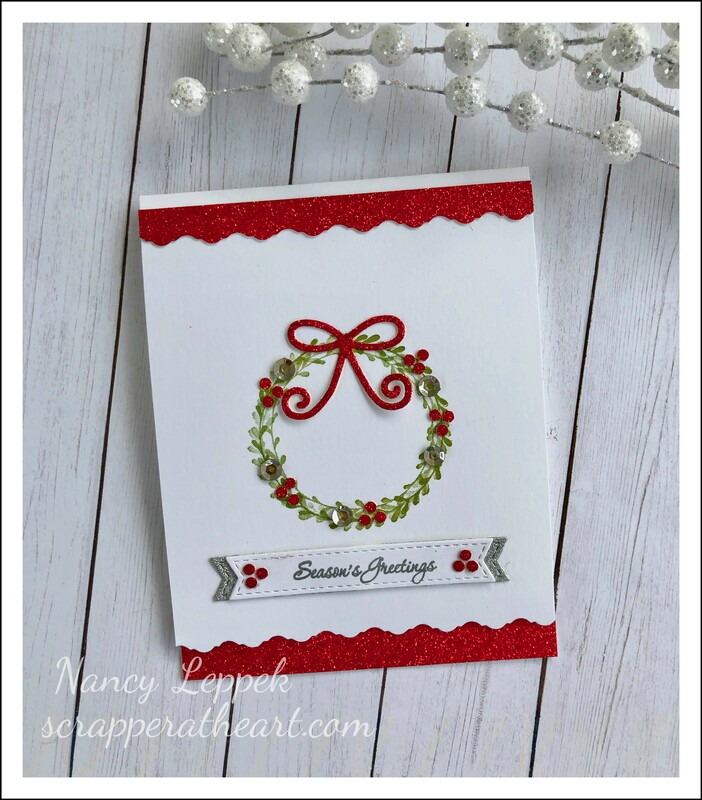 Nancy… your wreath is so sweet! Love all the red glitter paper touches. Thanks so much for joining us this week at The Paper Players. This is beautiful! Love all the white with the traditional red and green. So pretty Nancy! I love that pretty wreath and all of the sparkly details. Thanks so much for joining us this week over at The Paper Players. When I scrolled down to your post, I was so surprised by this lovely creation. It is so pleasing and pretty to the eye. Loving your delicate wreath. I love that simple wreath with the sparkling red, Nancy. It’s a beautifully festive Christmas card. You’ve captured my CAS-loving heart with your wreath, so pretty in red and green and with an added touch of sparkle! LOVE this! So thrilled you shared this festive delight in the Inkspirational gallery!